Bruce Lee is highly regarded as one of the most influential martial artist of all time. His amazing physical features, fitness, and skills made him a cultural icon. But perhaps unknown to some is his mental strength that contributed much to his success. He believed that any knowledge ultimately led to self-knowledge, and said that his chosen method of self-expression was martial arts. 6. “A wise man can learn more from a foolish question than a fool can learn from a wise answer." me being a fan of Bruce lee..
Bruce Lee = The original mixed martial artist! If spirituality is the basis of what you do, you will use your time chasing illusions. Facts, logic, and reality lead you to truth and accomplishment. Spirituality follows truth, not the other way around. Well, I must say you do not understand spirituality. What are facts, logic, reality - they are illusions. My friend, What does spirituality, mean to you?. Are you enlightened ? or have you gone beyond time & space dimensions and seen the reality?. If you have experienced that, then you understand spirituality and whatever you say is reality, is actually an illusion....so how come spirituality make you chase illusions....? "the style of no style"to me. This consisted of getting rid of the formalized approach...Now never turn your back around or you'll be knocked out! 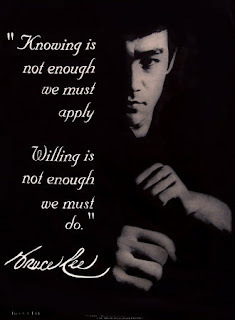 I love this quote and it's from Bruce Lee. "Your unlimited, is your limits"